Perry Hall is an unincorporated community and census-designated place in Baltimore County, Maryland, United States. The Perry Hall Improvement Association (PHIA) is the oldest and largest civic organization in northeastern Baltimore County, Maryland. Since Perry Hall is not incorporated, the PHIA is the dominant community-wide coalition in the area. An early version of the PHIA operated during the Second World War when Perry Hall residents organized a Health Committee to help veterans purchase wheelchairs, crutches, and other equipment. After the war ended, many of these leaders decided to create a permanent organization. The first meeting of the Perry Hall Improvement Association was held on July 31, 1945. After World War II, there was a wave of growth in northeastern Baltimore County. The PHIA defeated plans for a cemetery on the South Farm, a racetrack on Forge Road, and a drive-in movie theater near St. Joseph’s Roman Catholic Church. The PHIA also lobbied for lights along Joppa, Forge, and Cross Roads and Schroeder and Bauer Avenues. The PHIA pressured Baltimore County officials to fund road improvements and build new schools. Its greatest accomplishment came on September 8, 1963, when Baltimore County Executive Spiro Agnew and other officials dedicated the new Perry Hall library on Belair Road. The PHIA worked on civic activities as well, starting a Community Christmas Party in 1946 and a Halloween Parade in 1949. In 1976, the PHIA helped form a Bicentennial Committee that hosted events at the old Perry Hall School. By the 1970s and 1980s, however, leaders spent much of their time dealing with development. The most symbolic loss for the community was the development of Lassahn Field, long used for soccer games, carnivals, and Easter egg hunts. By the early 1990s, the community celebrated the opening of the Seven Oaks Senior Center and two new elementary schools, Seven Oaks and Joppa View. In 1994, the PHIA provided critical local support for the Honeygo Plan, a blueprint for developing Perry Hall’s rural northeast. 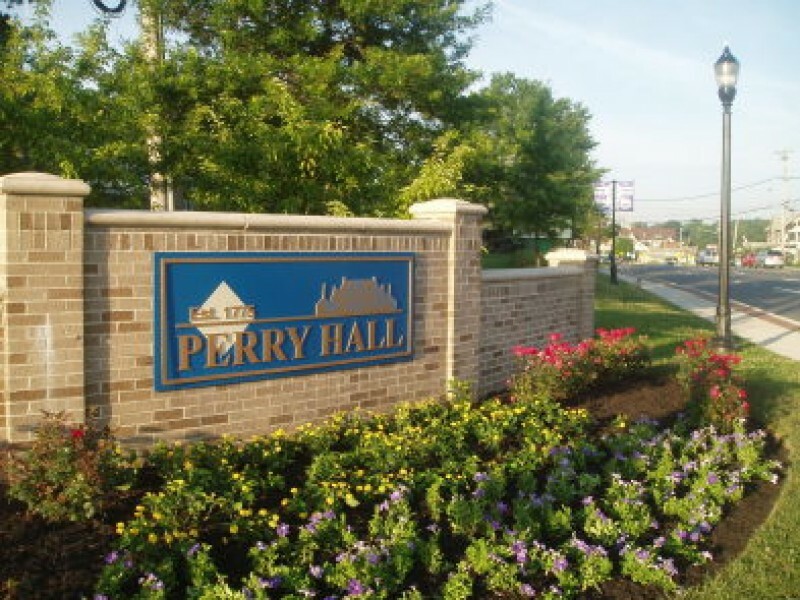 The Perry Hall community logo was adopted in 1997. With the Honeygo Plan adopted and much of the community now built-out, the PHIA focused in the late 1990s on some of the civic activities that had been abandoned years earlier. In 2000, Perry Hall celebrated its 225th birthday. The PHIA worked with other groups to restart the Halloween Parade and begin a summer concert series, the centerpiece of which was a performance by the Baltimore Symphony Orchestra. Also that year, the PHIA worked with other groups and elected officials to preserve the Perry Hall Mansion. The mansion was listed on the National Register of Historic Places in 1980. In November 2001, Baltimore County leaders announced plans to purchase the property.